Unbelievably, she never whimpered, barked, or whined. When I walked past the station nurses, I told them I was simply bringing items to make my wife more comfortable. No problem, they said. When we entered the room, my wife was asleep. I unzipped the suitcase, and Bella immediately jumped on the bed, and gingerly laid across her chest, somehow avoiding the wires and IV. She positioned herself to where she could look directly into my wife’s eyes, and laid completely still, until about twenty minutes later, when my wife woke up, and started moaning in pain. So touching! Dogs are the best! Beautiful. Exactly what I’d want. Yes Health and safety Why Shouldnt People have there Last Request. I think most hospitals would certainly oblige people, its not the dark ages. A great man, bless you! ooooh, this made me cry 🙁 dogs are the best in the world. In moments like these you can see it and feel it. So sorry for the loss of your wife,that’s one more reason why I love dogs so much.we have 4 dogs. Stephen Wragg….I’d expect you to do this for me!!! Aw Bella! If seeing your mom again was that easy! That is a Springer, wonder if the story is true. Awww he looks so sad ?? I’m so sorry we didn’t do that for my dad ?? John Deegan Inkwell you need to do this for me! It’s what Heros do! ? Mother fucker, you better sneak me out or sneak my dog in, or there will be every color of every filth ev-er-y-w-he-re, PERIOD. So sad..shouldnt have to sneak in a family member in. They are as much part of the family as any human if not more I know this in my case. I believe it’s beneficial to the patient and especially the animal.they to have feelings and will be much easier to accept the situation if they see it. But to keep them away is cruel. We did the same for my mother in law ! After she died we adopted her dog, Max became 17 years old ! ? Oh my God, such a sad, but heart touching story <3. I needed also a tissue ?? and yes please bring me my dog under any circumstances to my deathbed. But I can only hope that he goes first, otherwise the unbearable worry, of who would care after I'm gone…the bond is very strong…. Heartbreaking. Beautiful story. Rest in peace ? Becki Holtham that definetly brought tears to my eye!! So sad and so touching. My condolences for your loss. Good for you and Bella. Keep Bella safe and well as she very loving, loyal and faithful. My dog did the same… When I came back from a trip….sad.. 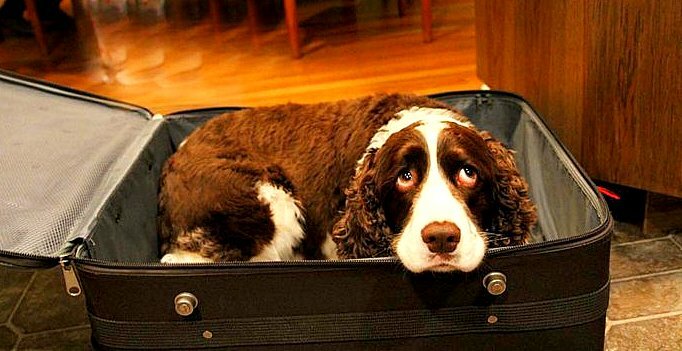 Words fail me that this husband needed to smuggle his wife’s best friend in to see her. Why oh why must these places be so hard hearted. I volunteer at an Hospice where patients animals are encourage to come in. The pleasure it brings these poorly people is a joy to see. Their pet is part of the family. Well done this man and shame on the hospital. Wowww…that just made me tear up????? Aww… Heart-breaking… So sad for his loss… ? So touching and sad story ? Sorry you had to sneak your dog in. I am so sorry for your loss and am glad she got to say goodbye! The last lines of this post broke my heart. I know how excited dogs get when they think they’re gonna see a person that’s dear to them, and I can’t stop crying after reading this ? Most hospitals allow pet visitation now with notice. Most hospital staff are unaware. I don’t know how my hubby would get 2 lively golden retrievers into the hospital, but that would be my dying wish. Too bad the dog needed to be snuck in that should just be allowed, they are your kids and the woman is dying! Omg such a sad story!????? Oh, I’m all choked up after reading this! My HEART Aches for you What a wonderful thing you did for your wife. When a animal loses there owners they get heart broken as we do .These beautiful Animals kneed a lot of love to get them threw there grieving. Only read this if you have a tissue handy. Many hospitals will allow dogs to come in to say goodbye to their owner. When my brother-in-law was dying they allowed his dog to come in for one last visit. I love my dog, I would want her to be next to me if ever I would be very sick !!! Best husband ever! And no…dogs should not have to be snuck in to see their human. They are part of the family, the pack. Thankfully I’m an ICU nurse at a hospital that has a pet policy. It’s under utilized but we could make this happen. Breaks my heart…so sorry for your and your and Bella’s loss..